I am taking a brief departure from posting on my three main pursuits, but for a good cause. As my family and friends know, I have been a vegetarian for almost four years and have dabbled in a vegan diet for the last eight months. This weekend, I started easing myself into what will hopefully be a full-blown-hippy-granola-soaking seeds-sippin’ wheat grass vegan lifestyle (at least in terms of food consumption). Eating vegan fare has been a tough goal to achieve thus far, primarily because of my love for strong cheddar, salty feta, and creamy brie…(distraction)…but I am now most determined to reintroduce myself to the foods that manage to exist without being zapped of their nutritional core and pumped with table salt and sugar. Hello unpackaged vegetables. Buona sera bulk grains. My inspiration and determination came from reading the first few chapters of Brendan Brazier’s Thrive: The Vegan Nutrition Guide to Optimal Performance in Sports and Life. My academic roots drew me to the colon in this very impressive title, a punctuation mark so very familiar in my “scholarly” reading. Brazier himself is a healthy dose of effective ethos as well. He is a professional tri-athlete and Ironman competitor who began researching and experimenting with a vegan diet at the age of 15 (I, however, think I still climbed trees at 15). Since high school, Brazier has developed a sustainable (in all the possible connotations of the word) culinary vegan lifestyle designed for optimum health without collapsing into a gaunt tree-hugger with a protruding collarbone. His diet is so effective, in fact, that Hugh Jackman wrote the forward to Brazier’s book after following the program while bulking up to play Wolverine for X-Men Origins. 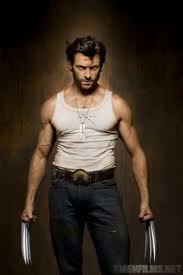 (Incidentally, according to sources, Jackman’s workout regime also consisted of much yoga and pilates. Take note boys.) Putting on another 20 pounds of lean muscle for the film “normally would mean a LOT of animal protein and synthetic protein powders,” Jackman writes, “While this worked in the past, I knew it wasn’t sustainable, that at some point my body (and probably my heart) would rebel. Not to mention that I often felt lethargic from eating so many hard to digest calories. Then there were the ethical considerations of the diet-environmental impact being the largest one.” Clearly, Brazier’s menu consisting of PH-balanced, nutrient-rich foods along with Jackman’s intense workout schedule produced the desired results (see accompanying image). Wolverine has always been my favorite X-Men character, and kudus to Jackman for his portrayal of this feral biker dude, but my goals are slightly different. I don’t need any more mass, just for the mass I have to change from flabby-fluff to toned and taught. I would also really like to stop craving Cape Cod Salt and Vinegar Chips, white queso dip, and relying on coffee for energy. So, I invested in this endeavor. I spent an hour in a grocery store called Earth Fare with a page-protected, color-coded list labeled “Week One,” loading my cart with hemp oil, adzuki beans, sesame seeds (hulled and unhulled), ground flaxseed, hemp protein powder (raw form), and green leafy things. I conveniently already had some of the necessary ingredients at home from all of my previous flirtations with a vegan diet, such as amaranth, quinoa, almond milk, and agave nectar. Amazon’s grocery section is supplying the raw cocao nibs and yerba mate. Yesterday, my husband and I had Almond Flaxseed Burgers with a Sweet Pepper Pesto sauce and mixed greens on the side for dinner. This morning, I fueled up with a Banana Pear Ginger smoothie for breakfast, green salad with Cayenne Dill dressing for lunch, and tonight’s supper will feature an Adzuki Quinoa pizza. All prepared by hand. All raw foods. (One important discovery so far is that my blender is sub-par.) I have soaked and prepared formerly dry beans, sprouted quinoa, and attempted to pop amaranth with mixed results (i.e. I burned some). My kitchen table is resplendent with all of the various parts of the dishes to be concocted, and my oven smells like apples and cinnamon courtesy of the cereal I made this afternoon on a cookie sheet coated in a light film of coconut oil. Thankfully, this process has not taken as much time as it sounds. Eventually, I anticipate having the foresight and experience to appropriately prep so the meals require no more than marrying several items onto the same plate. My kitchen skills are being tested, and I own foods whose names I am not sure how to pronounce, but I am excited. This, my friends, is the behind-the-scenes pursuit. I hope that changing what I put into my body will translate into being able to do more with this body in my other ventures. Grazie! It’s been kind of fun so far! First, the title was so…intriguing because I don’t know what amaranth is or why it requires popping. Lol. I feel a little bit more educated now. A little. Haha! Amaranth, apparently, is a pseudograin, whatever that is. It’s tiny and can be popped like pop corn to add nutritional “crunch” to energy bars or other dishes. I should bring you some cereal to try! It’s pretty good with almond milk. VERY filling and hardy! You MADE cereal!!! How awesome! I want to try some too. *hint, hint* I, too, am proud of you for jumping into vegan world with gusto. Way to go!